Fresh from her first murder case, Nantucket detective Merry Folger is unwillingly sucked into her second. When Joe Duarte, a fishing boat captain with decades of experience on the wild seas off Nantucket, is swept overboard during a spring storm, his death is pronounced accidental. But his estranged daughter, Del, is convinced it’s murder. She moves back to Nantucket to get closer to the truth, and enlists her old friend, detective Merry Folger, to help. But Del is also hiding secrets of her own, and the police are not inclined to help her with what they see as a wild goose chase. Merry has to defy her boss—her father—in order to investigate. Francine Mathews was born in Binghamton, New York, the last of six girls. She attended Princeton and Stanford Universities, where she studied history, before going on to work as an intelligence analyst at the CIA. She wrote her first book in 1992 and left the Agency a year later. Since then, she has written twenty-five books, including four other novels in the Merry Folger series (Death in the Off-Season, Death in a Mood Indigo, Death in a Cold Hard Light, and Death on Nantucket) as well as the nationally bestselling Being a Jane Austen mystery series, which she writes under the penname Stephanie Barron. She lives and works in Denver, Colorado. 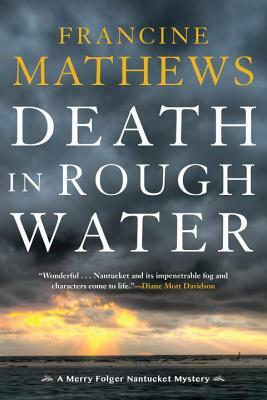 "Nantucket and its impenetrable, secretive fog and characters come to life in Mathews's capable hands." "Mathews uses her setting and its unique population skillfully." "Detective Merry Folger comes across as a real person, albeit a smart one, with doubts and concerns." "Merry Folger sails surely through choppy seas of murder, insurance fraud and infidelity in her second outing . . . Mathews skillfully incorporates close-knit relationships, small-town gossip and a salty Nantucket flavor."